One of the many gratifications of blogging is to connect with others who have similar interests; so it has been fantastic to receive user submissions (though admittedly I don't check my inbox frequently enough). The thoughtfulness of these nominations continues to impress me. Evan sent in 254 charts he created after looking at the post on baby names. An example is shown on the right. He is particularly interested in the question of names that are given to both males and females. For example, the bottom chart shows that Jordan is primarily a male name, and saw a period of growth followed by decline, although the decline has been more severe on the male side than the female side. It's a nice touch to label the most recent year. I'd also label the values for the most recent year on the axes. My solution was just to put two charts on each chart. 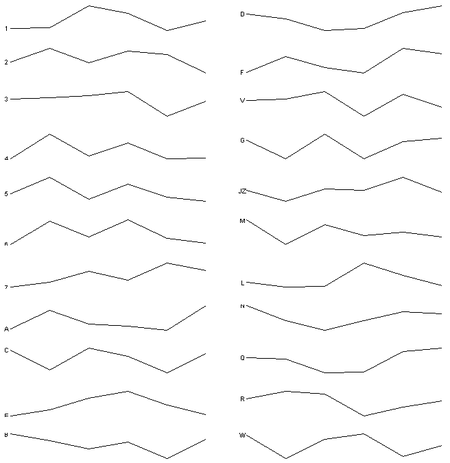 One at a fixed scale for every chart to give a sense of size and one at a variable scale to better show the shape of the plot. In other words, for less popular names, the top chart would look much more compressed. There are many more charts to sift through on his site. Evan welcomes suggestions. This NYC subway report is impossible to read. I have grouped the subway lines together (A/C/E, 4/5/6, etc.). The metrics are plotted left to right in the same order as in the original. Is it all noise and no signal? Source: "No. 1 Train is Rated Highest by Commuter Advocates", New York Times, July 24 2007. It's pretty hard to decree hard-and-fast rules for graphical design; every rule seems to admit its exception. This reinforces Tufte's contribution as he has successfully organized the rules in his collection of books. Dustin J sent in this chart from the Economist. Its first impression is ugly and overly complex. Steven Few says not to use stacked bar charts because you cannot compare individual values very easily and as a rule I avoid stacked bars with more than six or seven divisions. What do you think of this stacked bar--I think it is quite effective in telling the story. On this blog, I have also re-done some stacked bar charts but this one is truly an exception to the rule. The reason why this one works is that it's not about the individual components, it's showing that the US consumes more than all those countries combined. If only it has the proper caption! The Economist is uncharacteristically detached here: "Petrol consumption per day", "Litres bn, 2003". How about "Goliath v. Davids"? "US v. the World"? "Dream Team USA"? 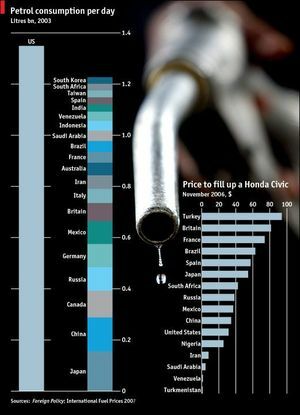 It'd help if they tone down the colors; also, by simply annotating the total litres for the US and the total for the other countries, they would have made a clearer point without using gridlines. But these are minor glitches in an otherwise effective chart. This chart from a Wall Street Journal editorial has been making the rounds lately, being ridiculed left and right. A number of you have been leaving comments here so I'm putting it up and center as our light entertainment for the week. The chart is being used to justify this economic concept called the "Laffer Curve" which claims that lowering tax rates can increase total tax receipts (for example, because fewer people will cheat the government.) As far as I know, it is dogma, and has never been proven empirically. I also agree with Prof. Gelman's skepticism about using countries as experimental units to inform domestic policy. This set of charts covered the back page of one of New York Times' sections this weekend. Regular readers will share my enthusiasm for the top chart. It makes a clear, cogent case to support the article's thesis concerning the rise of bottled water. Various renditions of this type of chart have appeared here, for example. The twenty-year horizon used is another nice touch. I'd remove the gridlines although they aren't too distracting here. Sadly, the second graphic does not meet the high standard of the first. The biggest problem concerns the red rectangle, purportedly showing how much of the bottled water was imported. The choice of differently-sized bottles as objects makes it impossible to gauge what proportion of the total was imported. If the rectangle was placed over 1-litre bottles instead, it would look smaller. Source: "A Battle Between the Bottle and the Faucet", New York Times, July 15, 2007. Aleks pointed to an interesting Business Week chart used to explain what people in different age groups are doing on-line. This is a pretty chart that does an admirable job with a difficult data set. The key to this chart, unfortunately missing, is that the percentages must be read as vertical columns to make sense. So the top left square says 34% of "Young Teens" who answered the survey said they create web pages on-line. In addition, the total of each column can be much more than 100% because multiple responses were allowed. The construct of the square grids is less damaging than it seems. In effect, the data has been rescaled by dividing by 10. The reader is then forced to apply "rounding". If you are someone who sees $19.95 as $19, then you'd round down the partial rows. If you see $19.95 as $20, you'd round up the partial rows. So the designer has pushed you to think in terms of whole numbers between 0 and 10, in other words, in units of 10%, rather than units of 1% or, horror of horrors, 0.1% or at some other unrealistic precision. This version gives a column view of the data, the lines linking percentages of each age group performing on-line activities. 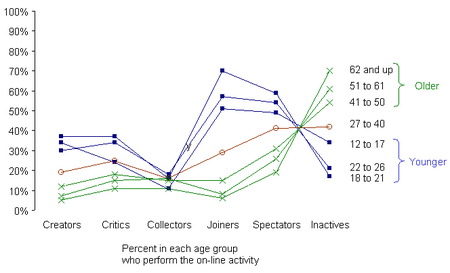 The profiles nicely cluster into three groups: the younger people are more likely to say they are "joiners", "spectators" or "creators" but less likely to be "inactives". We also see that the likelihood of being "Collectors" has little to do with age. Source: "Inside Innovation -- In Data", Business Week, June 11 2007. A good teacher makes a great difference. Reader Richard M drove this point home when he sent in a junk chart posing as educational material. 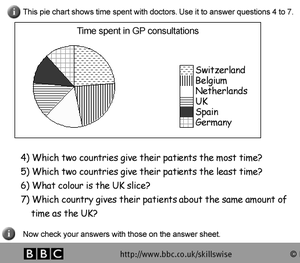 The offending graphic is used by BBC's Skillswise website to teach "Handling data: Graphs and Charts". Skillswise is an otherwise laudable effort to help adults "improve their basic skills in reading, writing and maths". Even for pros, each question is a challenge. Question 7 really requires a new pair of glasses. The entire worksheet is located here. The use of patterns for shading is especially disconcerting. The graphic also lacks self-sufficiency as we have trouble comparing countries without referencing the underlying data. As we discussed before, a good graphic is one in which graphical objects (bars, pies, dots, etc.) illuminate the underlying data; when all the data must be printed next to the objects, the graphic is most likely redundant.